The apps Apple has selected offer a wide variety of functions to promote a healthy and active lifestyle, in a number of new ways. Following an announcement from Thursday about new additions to the Siri Shortcuts roster, the new batch of third-party health services cover both apps and hardware that can communicate with iPhones and other items in the Apple ecosystem. 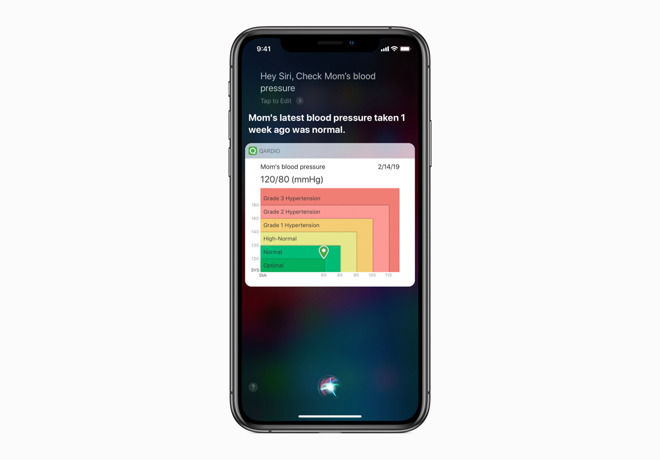 The app for the QardioArm smart blood pressure monitor can be queried remotely, allowing family members to ask the status of others who use the device, such as by asking "Hey Siri, what's mom's blood pressure?" The Dexcom Continuous Glucose Monitoring System, which was part of yesterday's group, can also provide results of blood glucose levels via Siri queries. Users of the Snoww app can use Siri Shortcuts to start a ski run, as well as to ask about the speed, elevation drops, and distance travelled. For HomeCourt, users can ask Siri to start a dribble workout, while the Nike Run Club app allows Siri to start a run and provide suggestions based on running habits. Habits are also brought up as an important part of keeping well, with Apple suggesting the use of Streaks, WaterMinder, and Yazio for logging activities via Siri. AutoSleep can provide data about a user's sleeping habits, including length and quality of sleep, and updates on reaching a sleep goal. Apple also suggests creating personalized routines using Siri Shortcuts. As an example, the prompt "Heading to the gym" could be used to start a workout within Nike Run Club, commence playing a workout playlist, and to enable Do Not Disturb until leaving the gym. Siri Shortcuts were added to iOS in September as part of iOS 12, but while its usage is slowly growing, the feature is relatively underused.